I grew up in Blacksburg, Virginia, the hometown of Virginia Tech & located in the heart of the Appalachian Mountains in western Virginia. I came to Columbus in the mid-70's for school, studying electrical engineering. I met my wife while in school and have since raised a family here. I joined L&E Research in 2016, coming from a varied career path that includes clinical pharmacy technician, big-box retail manager, AT&T telecom technician, and over thirty years of information technology management. This widely-ranging background has been a big help in managing the ever-changing needs of market research in my facility. When not working, I spend some time every day at the gym. I also like to hike / camp, read (a lot! ), and spend time with my grandchildren. 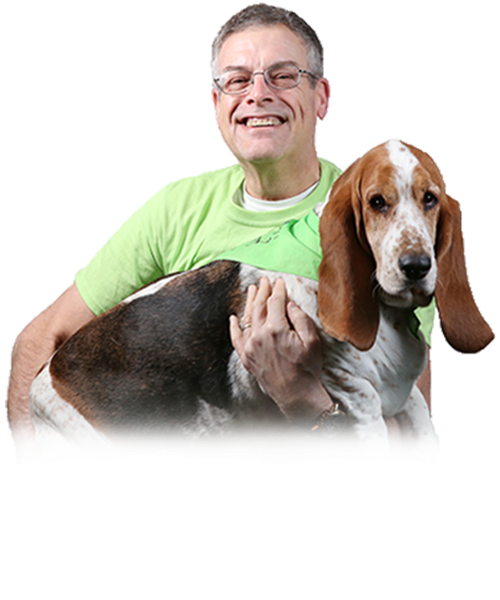 My wife & I are also active with dog rescue through Ohio Basset Hound Rescue, a breed-specific rescue in Ohio. We're long time basset hound owners and lovers, and it just seems fitting that we try to help those hounds that aren't so fortunate. You might not realize this about me- Five years ago, I was morbidly obese & very unhealthy. I spent two years losing 120lbs through diet and exercise. If I had a super power, it would be- The ability to make people truly understand one another. Can you imagine the possibilities? When I was young, I wanted to be- An astronomer. I had an unusual interest (according to my teachers) in outer space and everything in it. My favorite food is- Pizza, all types. I had to largely give it up when losing weight, and it was the single hardest adjustment I had to make. It would be impossible for me to give up- Pets. Pets are a great sanity check, good for peace of mind and for your blood pressure.